For four years, my loudspeaker cables have been resting peacefully on the carpeted floor of my listening room, blissfully happy while accepting a steady flow of current through their copper, silver and gold-plated conductors. Then, all of a sudden, audiophile missionaries decided to colonize my listening room. They righteously demanded that I dress these savage cables and prohibit them from ever lying down in parallel again! According to the sermons of the missionaries, if the cables must cross paths, each must be perpendicular to the other to prevent RFI and crosstalk. Rearranging my cables resulted in audible improvement so I went along with the fervent faithful. After visiting the Dedicated Audio room at CES this year, I requested a review sample of the Cable Towers to hear for myself the added benefits of suspending cables above a carpeted floor. According Daniel Harmon from Dedicated Audio, the static electricity produced by my builder's grade wall-to-wall carpet can have audible effects on speaker and power cables left lying around whose electromagnetic field around the conductors won't develop properly surrounded by static charges. The Cable Towers are designed to turn your power and speaker cables into an elevated electrical highway. 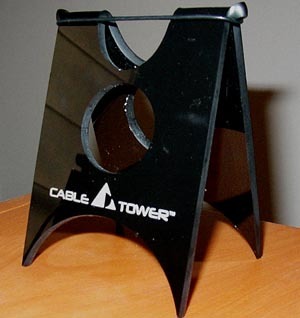 Unlike other cable elevation devices made of porcelain and metal, the Cable Towers are attractive with a glossy acrylic finish, tidy Dedicated Audio logo, machined acrylic points, triangular shape, cut out circles and half-circles for holding cables and a black O-ring retainer for the top groove. Setup was easy but do try the towers first using only the top slot. If you change your mind about how you want your cables arranged, you won't have to physically slide the cable out from the central hole. For this review, I placed Cable Towers under three power cables and a lengthy 15' pair of speaker cables. For ease of switching during ABA testing, I only used the top semi-circle of the cable towers with the O-rings. The Cable Towers are lightweight and the spikes are not able to pierce carpet so you may have to play around a little to make sure they offer optimal support without tipping over. As long as you aren't constantly changing out your cables, this should not be a problem. It took a while for me to arrange the Cable towers under my heavier power cables but the experience was never tedious. Some of the arrangements included loops, spirals and figure eights. I haven't had this much fun since I helped my daughter set up her Hot Wheels track last Christmas! Bull! - Big Mama from "Cat on a Hot Tin Roof"
I couldn't believe what I was hearing: greater transparency, improved dynamics and quieter backgrounds. All this from tiny acrylic saw-horses placed beneath my power and speaker cables! Over the next few weeks, I spent a lot of time ABA testing the Cable Towers with dozens of recordings. With each test, I was surprised by how much of an improvement they made for a system that I thought sounded pretty decent already. for that. The song "Coast to Coast" from the album Lovedrive [Mercury 34784 1979] is a mind-numbingly potent guitar riff over a steady beat. This album was remastered in 1997 and emphasizes the guitars. While the lead guitar saws out the melody, the electric bass slides down the scale and the rhythm guitars growl in the background. The effect of the Cable Towers was most noticeable in the higher frequencies. Cymbals crashed in time with less fuzziness than I normally hear in this recording. The trailing notes on strummed chords seemed longer. Background silences had less noise. The bass also benefited from the increased transparency. The rhythm section sounded tauter with the Cable Towers - the electric bass flexed some muscle and added heft to the steady rhythm. The whole musical image of the Kraut rockers was better resolved as though someone had used a squeegee to clean my window to the music. Removing the Cable Towers for comparison was definitely a step in the wrong direction. "What the hell is my carpet doing to my stereo?" was scribbled in my listening notes. Comparatively, the music shone weakly through a less-transparent window, dynamic range was reduced, the toms sounded more like plastic buckets than drums and the grinding crunch of the heavy guitars was less crunchy - like cereal that sits too long in milk. I couldn't wait to switch back and continue listening with the Cable Towers again. For a more challenging recording, Holbrooke's first piano concerto on Hyperion's Romantic Piano Concerto series [67127, 2000] offered a wider dynamic range. The third movement opens with crashing cymbals, blaring trombones and grand piano flourishes. With the Cable Towers, this piece had more dynamic room to stretch out - from subtle string ornaments to grand orchestral swoops. The silence behind the music sounded quieter, indicating that the Cable Towers managed to remove some noise in my cables. The resolution of the recording also sounded better. It was much easier to distinguish Hamish Milne's piano playing in passages where the piano has to force its way above the sound of the entire orchestra. Removing the Cable Towers made the noise from my carpet more apparent. The music sounded distorted in comparison. When Milne played massive chords on the piano, the instrument sounded grainy as if the notes were blurred together. The clarity of the higher frequencies was also lessened so that the sharp attacks of the hammers on the strings sounded rounded off. Like early spring in North Carolina when the bright green plants are covered in yellow pollen, the musical colors were tainted. The effect of the Cable Towers was like a spring shower that washed off the pollen-covered trees and revived the vivid greens of new life. Speaking of green, I recently indulged in the extended St. Patrick's Day sale on the Green Linnet website. This site should be a model for other music sites because almost all of the albums for sale can be heard in their entirety via low-res streaming audio. If you want people to buy more music, let them hear it. This type of marketing certainly convinced me - I have purchased four Green Linnet CDs so far. Cable Towers worked like a good conditioner and removed frizzy distortion while keeping enough body to allow the music to flow more naturally. After this experience, I am convinced that all of your cables should be off the floor. However, because the Cable Towers are passive devices, please don't expect them to cure any deficiencies inherent in your music system. 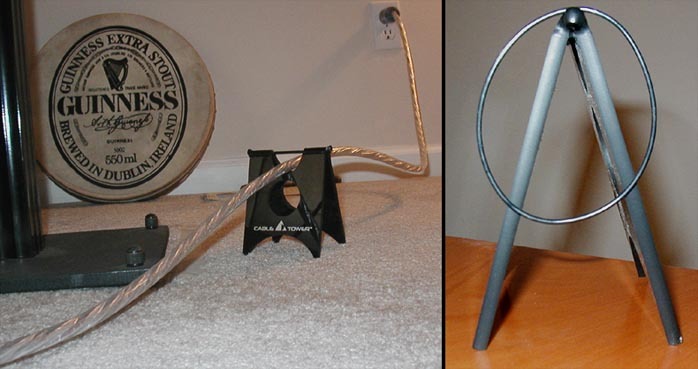 The Cable Towers simply made it easier for my music system to sound its best. Also, while I could speculate about which cables should be locked in the Cable Towers for the greatest sonic impact, the ultimate decision is dependent on your cables resting on your shag carpet, braided rug or jute mat. If, after reading this review, you are curious about the Cable Towers and have your cables lying on a carpeted floor, I highly recommend arranging for an in-home demo. You might be as surprised as I was. paper rolls on the floor of the listening room! I have not heard the cable elevators which are priced competitively with the Cable Towers. However, I haven't been won over by their porcelain appearance. The acrylic Cable Towers have classic lines and were stylish without looking gaudy. Of course, the Cable Towers are not just another audio-bauble to visually show off to your friends - they have been designed specifically for home audio applications. Musically, they delivered according to plan. They were also a lot of fun to set up and creatively arrange on the floor of my listening room. They helped my music system sound more transparent and display greater resolution, which made me a very happy savage. As for the missionaries? Well, they're okay as long as they don't stay for more than three days and keep away from the sweet spot on the futon. After all, a savage's island is his castle! Low capacitance-to-ground (or surroundings) is one of the main goals of the Cable Tower. Lower influences equates to less signal degradation, coloration and smear. We can achieve better tests results over the porcelain powerline insulators due to our lower dielectric constant, unique patent-pending design and lower contact surface area. Insertion capacitance is the capacitance gain each elevator (or Cable Tower) introduces into the signal path. As you can see, each porcelain insertion capacitance value is nearly 4 x greater than that of Cable Tower. For example, should a listener insert 4 risers per cable, the porcelain insulator will introduce nearly 16 x greater insertion capacitance per channel over the Cable Tower. Again, Cable Tower shows superior performance over the porcelain high-tension power pole insulator; lower capacitance and less signal degradation. We are very proud of our product. We took nearly a year to design and introduce to market. We wanted to be sure we got it right the first time. Within the brief four months since introduction at CES 2005, we have captured a substantial force of domestic and international dealers. Thank you for your time.